Durham County Poets grew out of the dynamic music scene in Ormstown, Quebec (originally called Durham County). Their debut album Where the River Flows, 2012, came on the heels of their first performance at the Branches and Roots’ Folk Festival in 2011. Their 2nd album, Chikkaboodah Stew, was released last year (2014) in the midst of a year busy with shows, interviews and television. 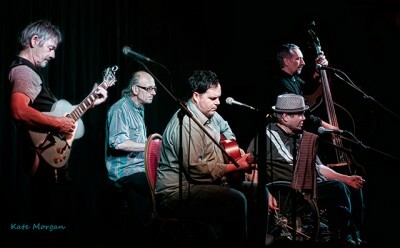 The band, consisting of Kevin Harvey, David Whyte, Neil Elsmore, Carl Rufh and James Preimel, still have plenty of material waiting to be recorded. With creative juices continuing to flow, the Poets are forging ahead, intending to leave their stamp on the Canadian music scene. Join us in welcoming this up and coming band here on the Deep Roots Music Festival stages this year.